Place the rice in a thick saucepan, cover with the water and place over medium heat. Once it comes to a boil, simmer for 5 minutes. Incorporate the milk, the sweetened condensed milk, vanilla extract, rind of an orange, cinnamon stick, salt and sugar. As soon as it starts simmering, reduce the heat to low. Once the rice is cooked through and soft, anywhere from 35 to 40 minutes, turn off the heat. If you wish to add raisins, do so at this point. There should still be a considerable amount of liquid in the pot. Once the rice cools down, it will puff up and the liquid will be further absorbed. You can serve the arroz con leche with fresh fruits such as berries, whipped cream, sprinkled ground cinnamon, or for a more over the top concoction, with chocolate syrup! El sabor de este arroz es igual como de Mí Abuela Celsa. Fue nacida en Zacatecas. Gracias otra vez por este recuerdo fino. 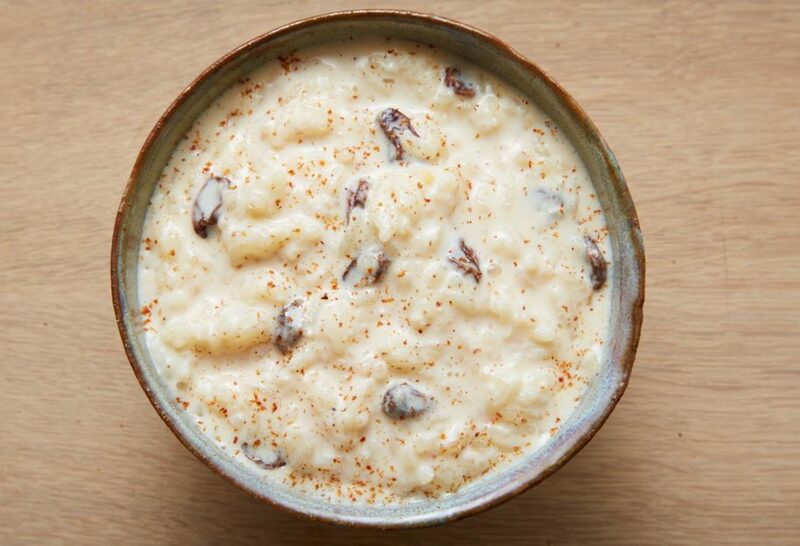 Hoy que hace mucho frio, se me antojo hacer arroz con leche. Nunca le he puesto cascara de naranja. Haber como queda. Hi Patti — love your show and look forward to making the rice pudding. It sounds like it will be so comforting over the winter. One question: should we zest the entire orange or put in the rind in whole pieces and remove them when we remove the cinnamon stick (which I think we probably do before serving?)? Thank you Jane! You can put the rind in whole pieces and remove them and the cinnamon stick before serving. Enjoy! Pati I just made the rice pudding! So easy and tastes the best !! Oh I’m happy that the recipes bring back good memories of your mom, Toni! I love rice pudding. I remember eating it as a child. It brings back wonderful memories of my Nanny an Granny. I am going to try your recipe. Thank you. I really love your show. Oh I’m so glad this brings back good memories, Zeneca. After adding the remaining ingredients is the heat suppose to be medium/high to come to a boil then reduced to simmer? Hi Patricia! Once you’ve added the milk, sweetened condensed milk, vanilla extract, rind of an orange, cinnamon stick, salt and sugar, you wait for it to simmer again and then reduce the heat to low. Pati I’m making this rice pudding as we speak I hope it’s comes out as good as yours is. My wife enjoy your show very much and love your sense of humor and your passion for cooking. Thank you we will keep watching for new recipes. I’m sure it will Michael! I think I loving cooking in the kitchen almost as much as you do. I teaching Mexican cooking classes in my community and use many of your recipes. God Bless you for the inspiration you give me. Mexican- Style Rice Pudding will be one of the recipes that I will teach the next time. It is so delicioso! Oh I’m so happy to hear that you have been so inspired. I hope you have lots of great classes…and say hi to your students for me, Lupita. We love watching your cooking show. I’m ashamed of myself because this is a dish i should have learned frm my mom. Thanks to your show I now can make. Keep the receipes coming! Have lots of fun in the kitchen, Janet! And say hi to your husband for me. We love your recipes Pati! So glad you like it Patricia. Do you groov grind the cinnamon stoc stick or is it left whole and then removed? Same question about the orange rib rind. Hi Patti! I love your show and your recipes so much, thank you for sharing them. There are TOO many types of rice, please tell me the best brand to use. Thank YOU for trying the recipes, Irene! Any brand is great…for this recipe just look for a package that says long or extra-long rice.